I’m not going to spend too much time on describing things like functions and build quality. Instead I want to give an overview of my impressions and stress one point in particular. The manual version V850 and V850II do all the standard manual speedlite things. The Canon, Nikon and Sony dedicated V860 units do Canon, Nikon and Sony specific fancy stuff that I don’t care about. You might though, so head here to Flash Havoc to get the lowdown. These units seem to be built with about the same degree of robustness as other brands I’m familiar with or have handled. They feel maybe not quite as solid or tough as the similar products from Lumopro, but that may just be the impression that the more militaristic / ballistic / full of little angels Lumopro design elements give. Admittedly I tend to be quite careful with my gear, but I have had no trouble nor any concerns with these flash units in terms of their durability. It is sometimes held that cheaper and / or smaller lighting units, such as speedlite / hotshot flashes in general, are not quite as colour consistent or output consistent on a per unit basis as more sophisticated and more expensive lighting solutions. * Sometimes, it is claimed, they can vary quite a lot during a session or even from one firing to the next. I lack both the equipment and the inclination to test such things, but Flash Havoc and others have noted that the V850 / V860 series speedlites are comparable to similar products from other top end manufacturers. The same also seems to hold true for other parameters, such as evenness of spread and falloff, etc. The original Flash Havoc review deals with these points quite thoroughly and reports very favourably here. All of the above is just a long winded way of saying I’m totally happy with performance, have had no issues with performance in any way at all and I’m not aware of any major current issues either. Some reviews and commentators note that as Godox rolls things out quite quickly in an ever evolving kind of manner, there are occasionally a few glitches with early production units for new lines of products, etc. They also note these problems are usually resolved fairly quickly. There have been hardware issues in the past, for example, with batteries, but as far as I know, everything is fine as of right now. Mac users do have to jump through a few hoops for software updates however. 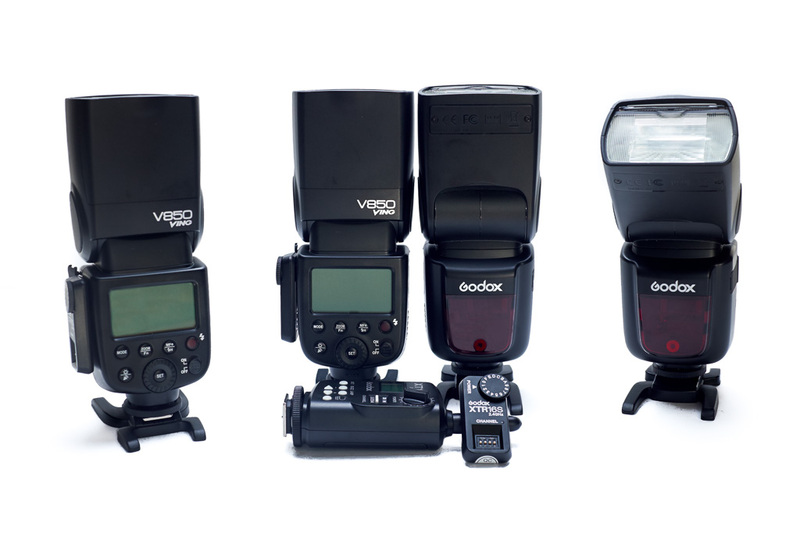 Currently, Godox version II models, including the V850II / V860II, have built in 2.4 GHz radio receivers. For older V850 / V860 series speedlites, you can add the plug-in XTR16s 2.4 GHz receiver** and use a corresponding transmitter – XT16 / XT32 / X1T. *** I have the plain Jane manual XT16 to fire my XTR16s equipped V850 flashes. Um, works fine. It’s essentially intuitive. You just make sure the little channel slider switches on each XTR16(s) and the XT16 transmitter are all set to the same pattern and are thus all on the same frequency (doesn’t really matter which channel you use, but if you are at an event with other photographers or picking up interference for some other reason, then you can move to a different channel). Then, each flash’s XTR16(s) gets set to a letter or number on its dial. If two or more flashes are set to the same letter/number they from a group and will be adjusted together. As the name implies, you can have up to 16 groups. 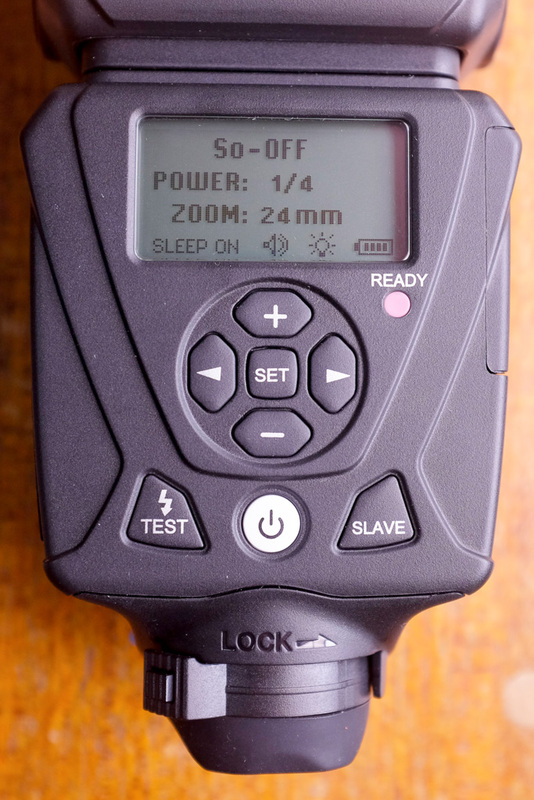 Then on the XT16 transmitter, you select the number on its dial that corresponds with the flash or group you want to control, and use the + / – arrow buttons to change the power settings in ⅓ steps for that flash or group of flashes. Looks confusing, but really it is easy. For the version II speedlites and the XT32 / X1T LCD screen equipped transmitters, you essentially do the same (& a lot more for the TTL versions) on screen. So, that brings me to the important bit, or at least, the bit I feel is important: the battery. Currently and as far as I’m aware, the latest and the legacy models of the V850 / V860 range are the only speedlites / hotshot flashes to use propriety single unit rechargeable Lithium-ion batteries. As Flash Havoc notes, the VB18 battery provides “a massive 650 full power pops!” The full power recycle time is impressive too, at 1.5 seconds. Most speedlites / hotshot flashes are powered by 4 AA sized batteries. The single 2000mAh, 11.1V battery gives the equivalent of 12 AA batteries. Again as Flash Havoc notes, not only is this like having an external power pack actually built in to the flash, it is also a huge cost saving, as you get a charger and the equivalent of 12 AA rechargeable batteries included in the already low cost. How long does the battery power the flash for in the real world? Bloody forever, that’s how long. The last portrait session I did at my home studio, I was running a butterflied soft box setup with one powered by a V850 and the other by a Lumopro LP180. Unfortunately, I can’t remember the exact details now, but both flashes were set the same, at around ½ power. By the time I went through two sets of good quality and freshly charged Eneloop batteries in the Lumopro (i.e. 8 batteries worth), the battery level indicator was still showing two out of three bars on the V850! The batteries also seem to hold their charge really well. At one stage I pulled a V850 that I hadn’t used for around a month out from the bottom of my bag and it was still showing a full change and preformed just as long as a recently charged one. When I got my first V850 I was just testing the waters, so didn’t get a spare battery at the time. Glad I didn’t, as I’ve never ever run out of juice, and for my typical needs, I doubt I ever will. Maybe for others who cover long time periods, like wedding or event photographers, spare sets might be advisable. My typical portrait sessions run from around two to four hours, and the only time I’ve ended up working in the last bar of the indicator is when I’ve done two sessions with no recharge in between. So, there we have it. Compatible output (as in, can be paired at same settings with other high quality brands). Comparable general performance and reliability with other similar class but much more expensive products. Outstanding, basically entry level price. Truly phenomenal battery performance. Built in radio control functionality. Expanding integration with other Godox products. Works. * different people claim different things and the two common but contrasting views I’ve come across are a) that colour output is often or usually inconsistent in both cheap lighting solutions and speedlites / hotshot flashes in general, and b) that with lower power units like speedlites / hotshot flashes, this isn’t usually a problem. Me, I don’t actually know. *** all the different options and possibilities are a bit of a mine field, and I’m trying to be brief here. The XT16 provides only manual power control, the XT32 provides only manual power control and additionally HSS for Canon / Nikon / Sony V860 units. For TTL with the V860 units you need the appropriate X1T versions and, if using a first generation V860, an X1R – i.e. receiver unit. Also, and very groovily, it has a built in gel holder and a ¼″ 20 threaded mounting point (i.e. tripod socket) on the side – both really very nice features, and apparently unique and unique in this flash class respectively. The LP180 has received a lot of praise on the internet, from some quite prominent photographers and from some quite capable and experienced photographers (I say that, cos the truth is they are not always one and the same*). One thing I note is that quite a few people have commented on how robust this unit is. Lacking enough experience with flash units, I can’t really speak to this. To me, it just feels like what I’d expect a plastic thing of about this size, shape and nature to feel like. Not flimsy, but certainly not built like a tank either, as some have claimed. Here I’ll just defer to those with more experience, and accept that compared to others, it is apparently more rugged than the norm. I will just add though, that I suspect its matt finish and well placed angular design elements make it feel more rugged than it really is. It has an audible signal to let you know when the capacitor is charged. That’s a nice feature, but it could do with being louder. It’s also nice that it has an auto sleep / auto power off feature, but 20 minutes to sleep is too long, not to mention it takes 3 hours after that for auto power off to engage! If I’m not using it and I’ve forgotten to turn it off, probably 20 minutes would be a more sensible time for auto power off. I have read where people have complained about the LCD display, saying that it’s too hard to read (too busy and too angle dependant). I don’t really have a problem with it. Really, there’s not that much to adjust, and mostly I do it by feel anyway. If you are using this unit in a modifier, then most likely it will just stay on 24mm, so then the only thing that typically gets used are the off/on switch and the power level buttons. I tend to guess at what power I’ll be starting at, and then just click up and down without looking. It does’t matter what the number is, exposure is also tied (primarily) to aperture and ISO, so it’s all relative. Is it reliable? Hasn’t let me down yet, but then why would it? I haven’t had it all that long, and in fact, no one has really – it’s still too new. Apparently the older models were all very reliable, so there’s no reason to think this would be any different. Somewhere I have read an account of it taking a spill onto hard ground and surviving, and also of being used in pouring rain without trouble (note though, LumoPro does not claim it is weather resistant). To me it seems like a very good, easy to use, reliable, powerful manual flash; one that promises durability and dependability. The negative points I’ve mentioned above are just minor quibbles, and not worth worrying about too much. So, pretty good all round. The other, more serious problem the LP180 has is to do with the future. It is fast becoming outdated. The current manual YongNuo YN-560 III already has built-in radio triggering, and when the new flash trigger arrives will feature remote manual power control. Recently Cactus have released a new flash unit and a matching radio transceiver,*** not only with built in radio triggering, but also power control across multiple groups (and a whole bunch of other TTL related stuff that people who manually control their lighting won’t care about, but that many will). The proposed price for this extremely promising and most likely game changing flash unit will be about US$60 less than the LP180! With many modifiers, line of sight triggering systems are at best problematic and at worst, useless. That knocks out much of the LP180’s ‘quad’ connectivity, leaving really only the ability to be connected to a remote radio trigger via PC or, more likely, mini-phone. **** That’s an extra expense. Also, many softboxes require awkward access to adjust power or other settings, and even with modifiers that leave the flash controls accessible, they are often high up and awkward to reach, not to mention a pain to lower, adjust and the raise again. Those working with multiple lights find these problems compounded by a factor equivalent to the number of lights they are using. The ability to remotely control power settings across multiple groups solves all of this. I have no idea how important the LP180 is to LumoPro and their business, but unless they really ramp up future releases to at least match the Cactus, and at a suitable price and soon, then I can’t really see anyone buying this product. I mean, really, why would you? * I’m neither – ha! Well, not quite midnight, but awfully late for little kids to be up. Didn’t matter so much though, as today is a national holiday. 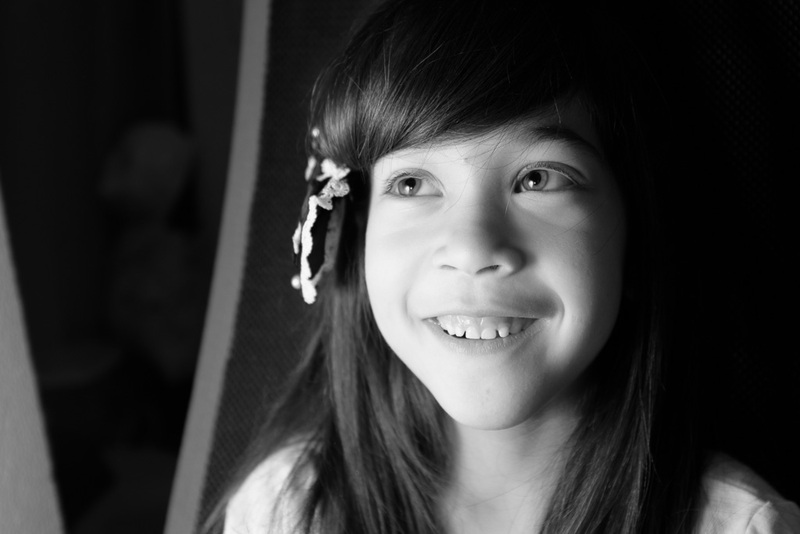 Anyway, my wife was playing around with my daughter’s hair, and I decided to take a quick shot. 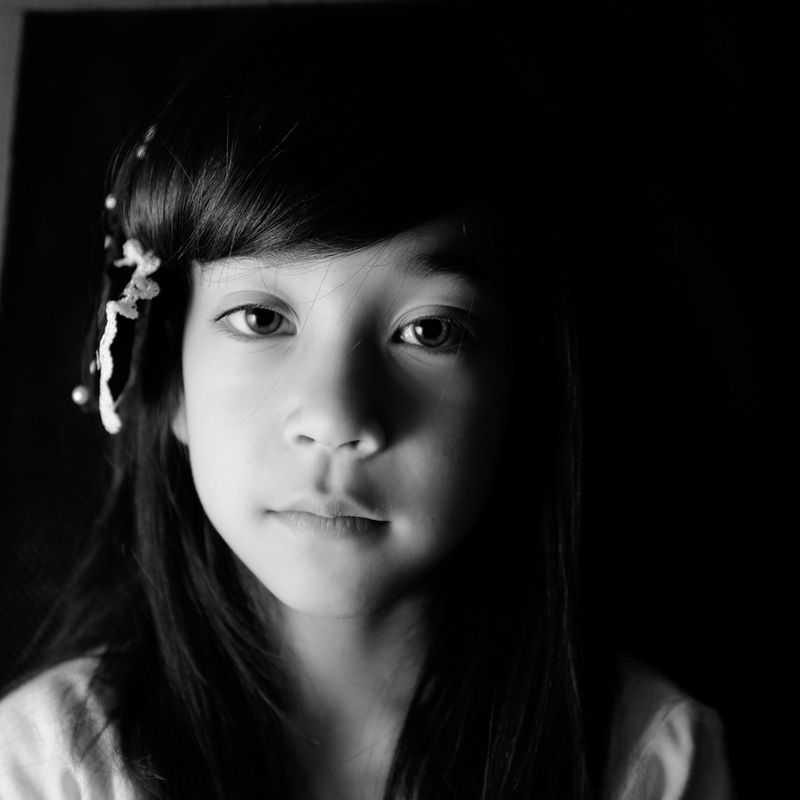 Whipped out my Lumopro LP180, and just had my wife point it at a white polystyrene board that I also had her holding next to my daughter. You can see it in the edge of the frame in the second shot below (an exposure test shot) & the cropped B&W rescue version below that (where it doesn’t really seem to matter).